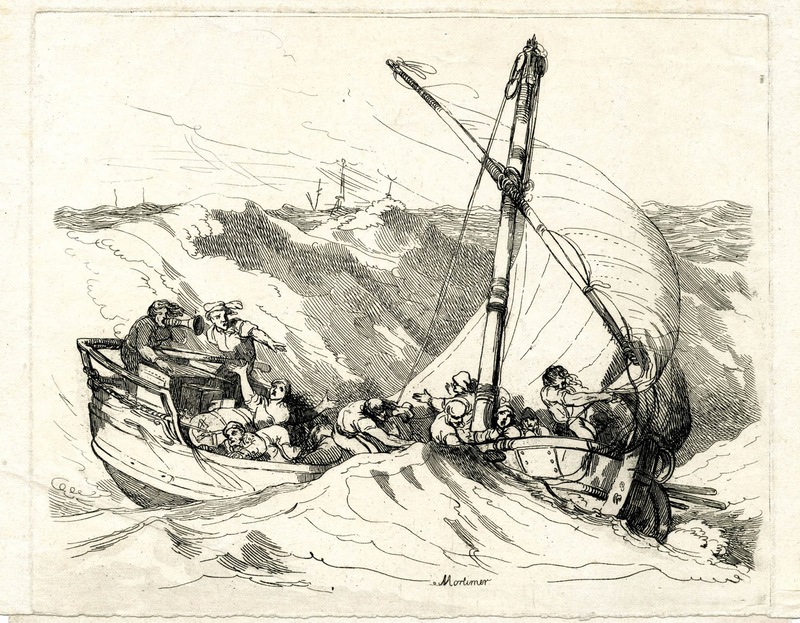 Sketch of a boat in distress, from "Imitations of Modern Drawings," John Hamilton Mortimer, engraved by Thomas Rowlandson, c. 1784-1788, British Museum. 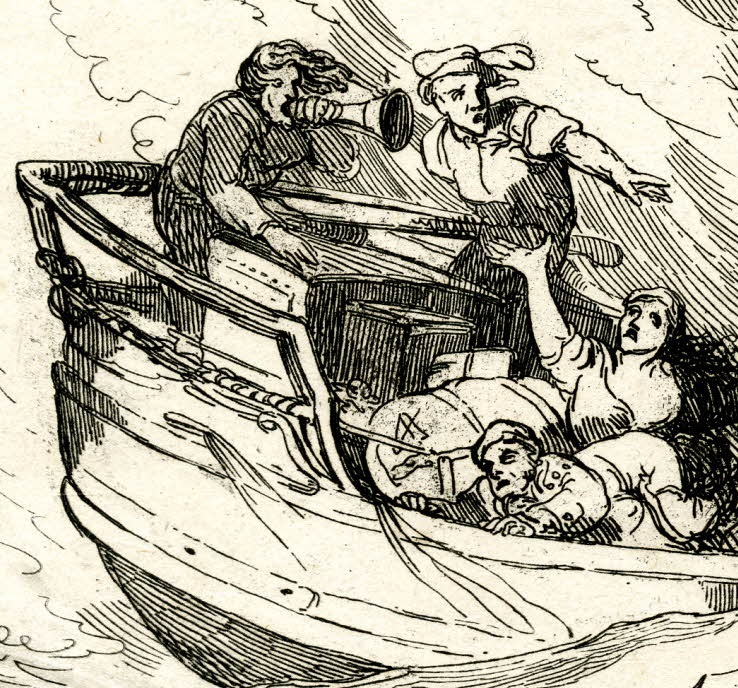 Rowlandson's affinity for invoking the fears of sailors has surfaced on this blog before. The mariners and passengers on this open boat have a somewhat better chance than the pair of sailors stranded on flotsam depicted in his 1786 piece "Misery." Even so, their situation is dire. Buried in the trough of towering waves, the sailors fight to bring the lone sail to bear, while the passengers crammed between the narrow bulwarks panic. Far in the background, beyond the sight of the distressed by well in view of the audience, are the three masts of their dying ship. The masts are leaning to the right, sliding down toward the ocean surface. Standing at the stern and shouting through a speaking trumpet, one of the sailors takes command. It is unclear precisely who this man is, but he wears a pair of loose fitting trousers, and it appears that his jacket is tucked into the waistband. Beside him is the coxswain, who sports an oddly anachronistic cap. Perhaps this print is meant to represent an earlier time. Reaching up to heaven with an imploring hand, a woman grieves at their collective suffering. Reaching for a the starboard rail, a man is doubled over, perhaps with seasickness. He wears a cap not unlike that of the coxswain, and what appears to be a pair of trousers and a jacket with mariner's cuffs. Gathered around the mast are more men. A couple of them wear odd caps of a sort of conical shape. The second man from the right has a particularly dark cap, which at first led me to think it was perhaps an eighteenth century version of a sou'wester. 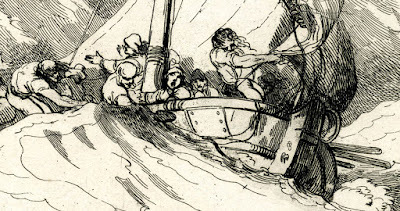 However, the shading by Rowlandson on the sail to either side of the man match that of his hat, and so I believe this is a result of lighting, not material. In any case, a couple of the men here wear trousers and shirt with no waistcoat or jacket. Like the coxswain at the stern, their sleeves are rolled up past their elbows.